FOLLOW-UP “GERMAN CONTEMPORARY EXCELLENCE” | Meisterkreis – Deutschland e.V. November 16, 2018: Shanghai. A roundtable discussion took place at the residence of German Consul General Dr. Christine Althauser; this was a follow-up to the GERMAN CONTEMPORARY EXCELLENCE exhibition in 2017 and was held on the occasion of the guest performance of “Der Sandmann” by director Robert Wilson at the China International Arts Festival in the Shanghai Grand Theatre, supported by Leica and Meisterkreis. The participants represented a colourful mixture from the fields of economy, craftsmanship, politics, science, culture and art. Governor Lin Xiaojue of the Jing'an District invited Meisterkreis to subsequent consultations at her office; the agenda included the new CIIE fair grounds as well as support for the construction of the Jing'an brand using concepts of culture, gastronomy and lifestyle. 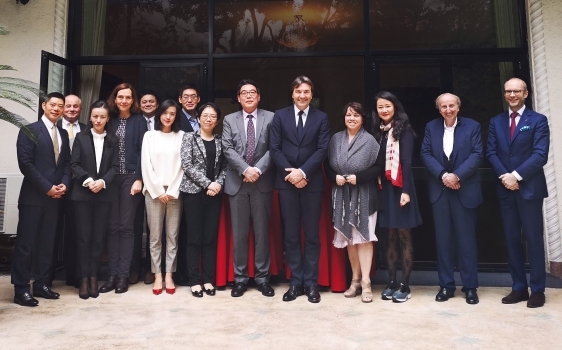 It was arranged with the K11 Board, Department Store and Art-Mall, Shanghai, to form common teams in order to develop a concept for pop-up events for German Excellence. A mixture of brand experience, mediation of knowledge regarding technology and craftsmanship, and the joy of discovery form the first conceptual cornerstones. A few days before, Katharina Grosse premiered her first solo exhibition at the K11 Shanghai, and “Der Sandmann” was honoured by capturing the China International Arts Festival Audience Award.